​The first scheduled airline service at Atlanta occurred on the morning of September 15, 1926 when a Florida Airways plane departed for Jacksonville, Florida with continuing service to Tampa, Ft. Myers and Miami. The airline had been been awarded Contract Air Mail Route 10 (CAM 10) between Atlanta, and Miami and the Atlanta - Jacksonville segment was an extension of the existing Miami - Ft. Myers - Tampa - Jacksonville route established on April 1, 1926. While the morning flight departed with little fanfare, an enormous celebration greeted the first arriving flight that afternoon. The Atlanta Constitution reported: "As hundreds of factory whistles screeched a raucous welcome, the first official mail-carrying airplane to fly to Atlanta arrived at Candler field at 3:31 o'clock Wednesday afternoon. A crowd of more than 15,000 people was on hand to greet it, and with impressive ceremonies it was christened "Miss Atlanta" in the fleet of planes to be used in the new service between this city and Miami, Fla. Almost simultaneously with arrival of the plane in Atlanta, news was received that another plane which left Atlanta Wednesday morning carrying mail to Miami had arrived in that city, thus inaugurating the first double air mail service between Atlanta and other southern cities." ​Unfortunately, Florida Airways quietly ceased operations only 9 months later leaving Atlanta and its new airport without airline service. In August 1927, New Orleans-based St. Tammany - Gulf Coast Airways began airline service to Atlanta followed by Pitcairn Aviation in 1928. Pitcairn would eventually become Eastern Air Lines which, along with Delta, dominated Atlanta Airport for more than six decades. Charles Lindbergh visited Atlanta Airport on October 11, 1927 during a cross-country tour following his solo flight across the Atlantic. The aircraft in the foreground is a Ryan B-1 similar to the "Spirit of St. Louis". 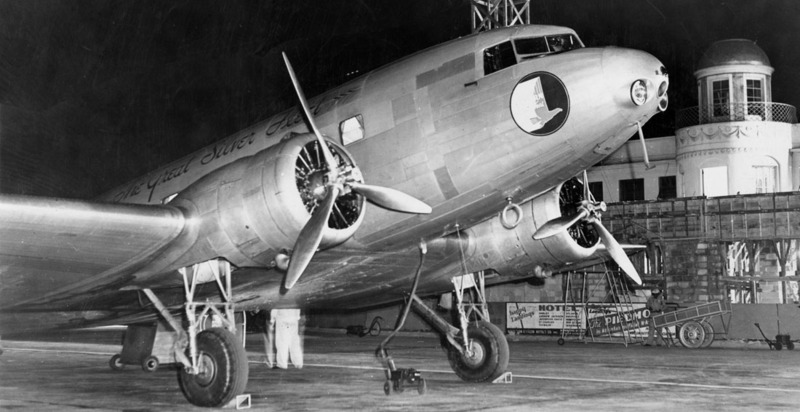 The actual "Spirit of St. Louis" lacked cockpit and cabin windows due to extra fuel tanks that were installed for the trans-Atlantic flight. During his visit to Atlanta Lindbergh ended up ankle deep in mud after his aircraft became stuck in the wet Georgia red clay. 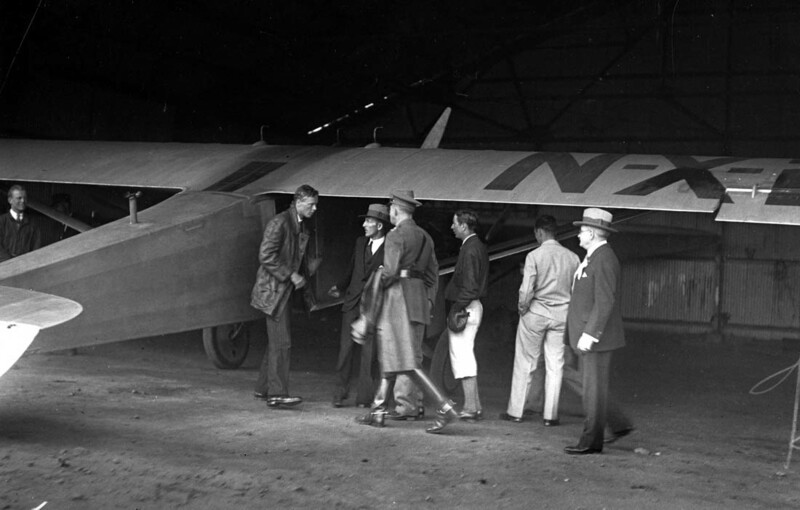 Lindbergh was met by local dignitaries upon his arrival at Candler Field. He was then escorted to downtown Atlanta for a parade in his honor where thousands of spectators lined the streets to see him. It was the largest public gathering in Atlanta's history at the time. He then gave a speech to a crowd of 20,000 at Georgia Tech's Grant Field promoting the development of commercial aviation and Air Mail services. His forward-thinking vision coupled with his status as a national hero helped change the public perception of air travel from that of a dangerous novelty to an accepted form of transportation. 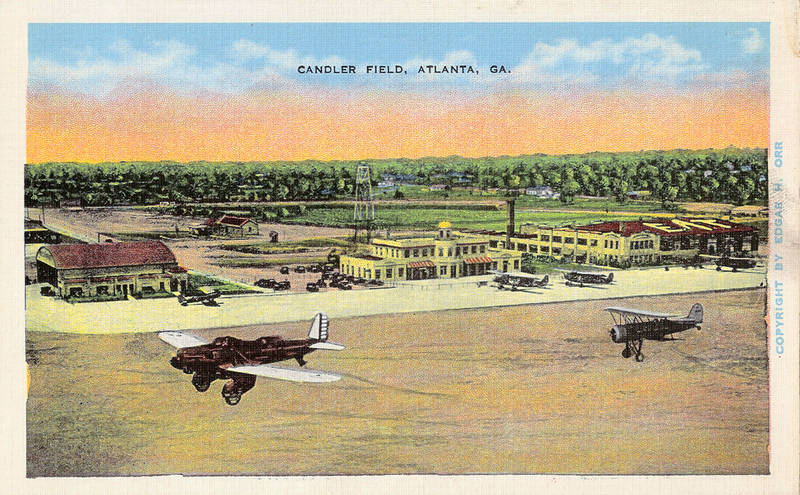 His visit to Atlanta was a major catalyst for the rapid expansion of Candler Field in the 1930s. 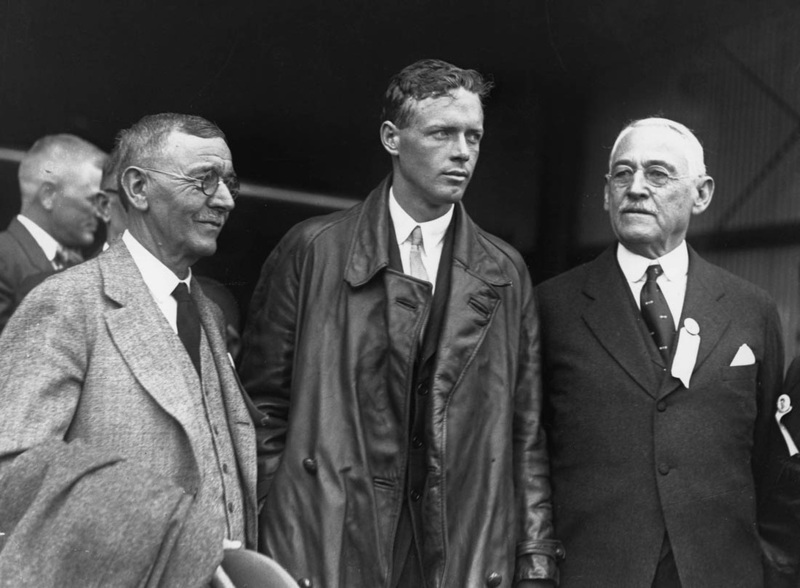 Charles Lindbergh poses with Atlanta Mayor Isaac N. Ragsdale (left) and Georgia Gov. Lamartine Hardman (right) at Candler Field on October 11, 1927. This day was officially declared "Lindbergh Day" in Atlanta and the city renamed Mayson Avenue to Lindbergh Drive in his honor. Photo courtesy of the Atlanta-Journal Constitution. 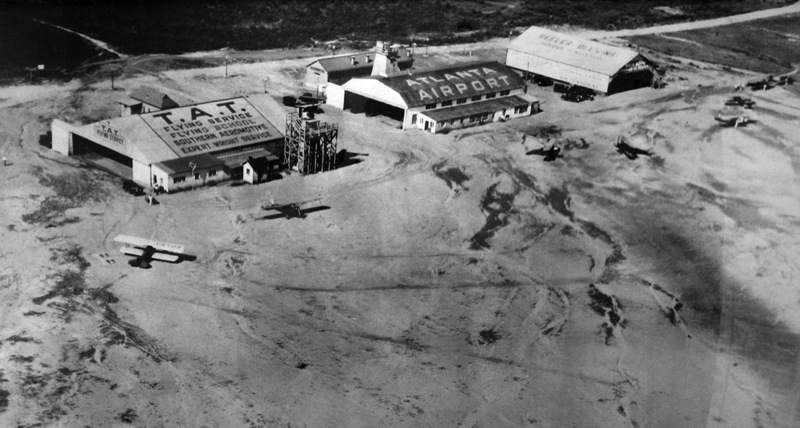 A 1929 view of the airport showing T.A.T. 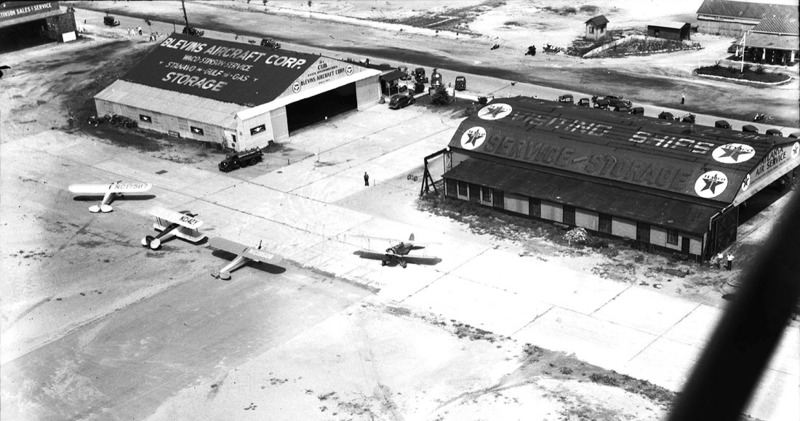 Flying Service, Pitcairn Aviation (with Atlanta Airport on the roof), and the Beeler Blevins hangar. T.A.T. was a predecessor of American Airlines. To give you an idea of the location of these buildings, here's an old topographic map of Candler Field matched up with a current map and aerial photo from Google Maps. The three buildings in the photo above appear near the center of the map. Click the thumbnails or arrows to toggle between images. The topo map was found on Jack Kittle's amazing Atlanta Street Map Overlay. 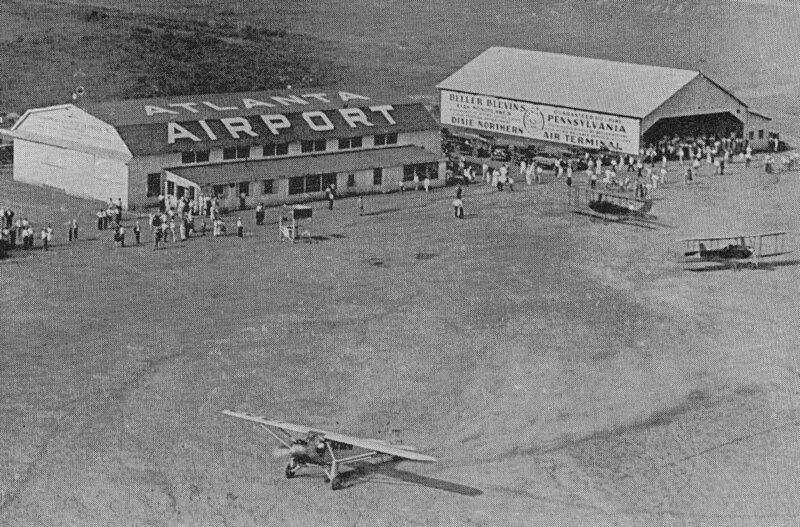 Atlanta opened a new $30,000 administration and passenger terminal with great fanfare on May 7, 1932. 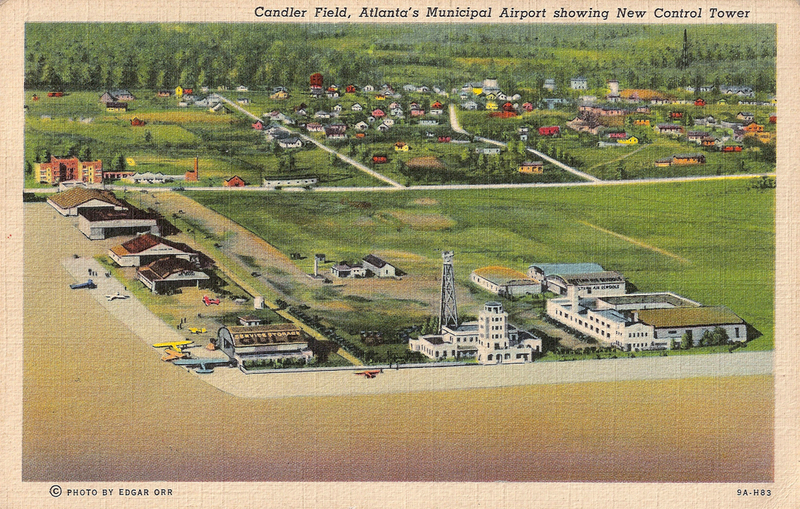 The terminal is pictured at the center of this postcard and served the airport until 1948. This was also the first control tower at Atlanta airport. The building at far right, with the letters E.A.T. (Eastern Air Transport) on the roof, was Atlanta's first airline terminal. 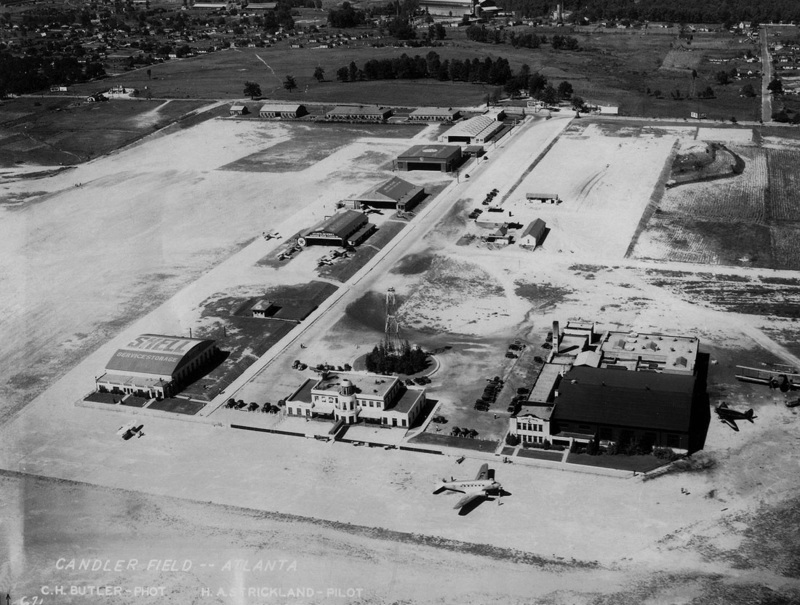 The hangar on the left originally housed the facilities for American Airways. The 3 large aircraft parked on the ramp are Stinson T Tri-Motors. Ron Alexander, owner of DC-3 N28AA, is reconstructing the 1930s era Atlanta Airport at The Candler Field Museum south of Atlanta. 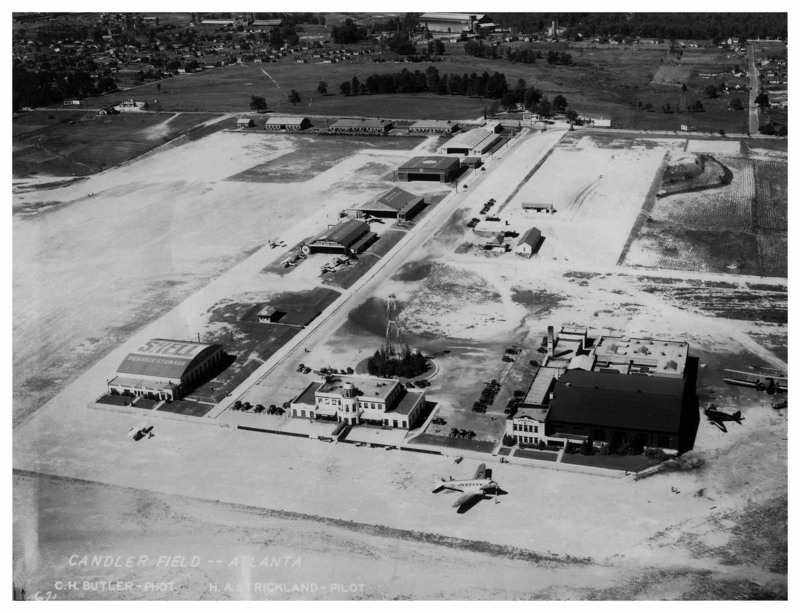 Circa 1933 view showing American Airways (now American Airlines) hangar in the foreground. 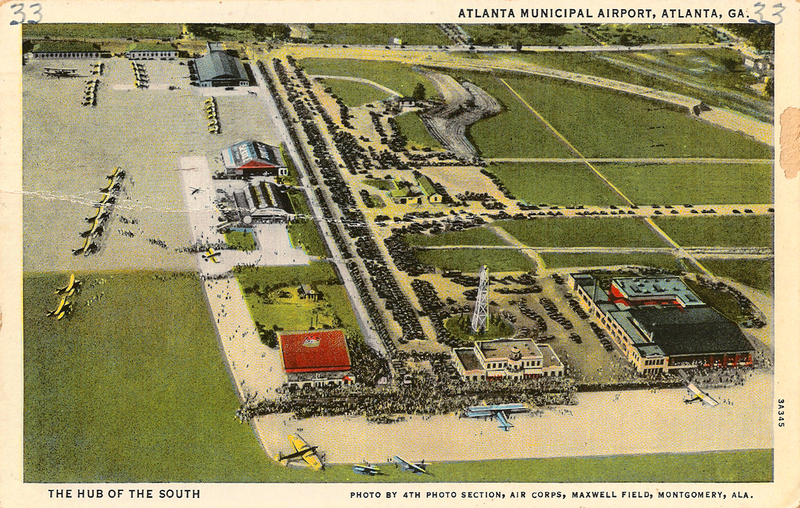 American lost its Atlanta routes in 1934 when new Air Mail contracts were awarded to Eastern and Delta, which had inaugurated service to Atlanta in 1930. 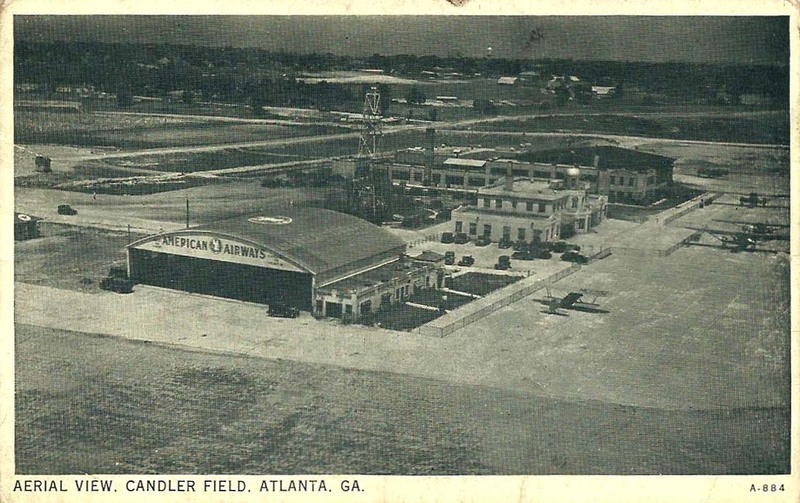 The airport name was officially changed to Atlanta Municipal Airport in 1929, although it was also referred to as Candler Field into the 1940s. This postcard depicts the airport during an air show in 1933. 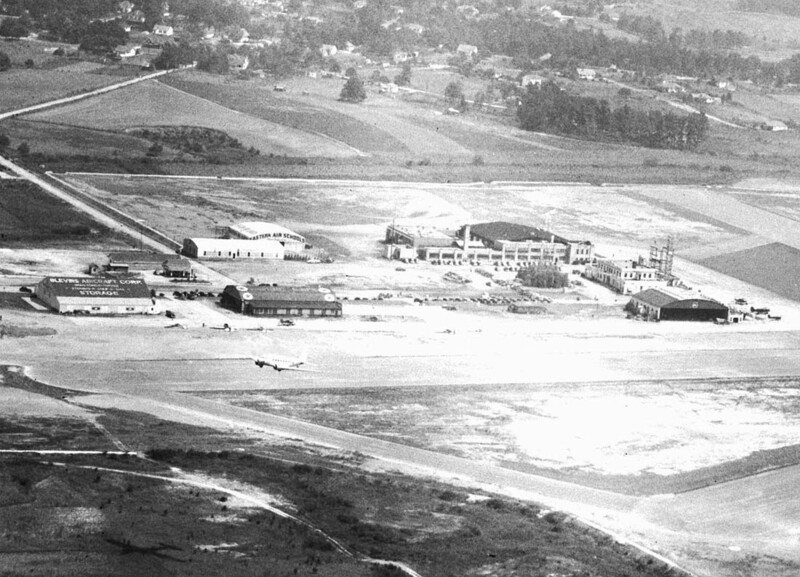 A similar photo of the airport taken the same day as the previous postcard, July 8, 1933. Click ﻿HERE﻿ to see the hi-res version. The detail is amazing! Photo courtesy of the Vanishing Georgia archives. Another photo from July 8, 1933, this time facing south. The remains of the old racetrack are clearly visible at top left. Army buildings lined Virginia Avenue in the foreground. Click HERE for a larger, more detailed version. Photo courtesy of the Vanishing Georgia archives. 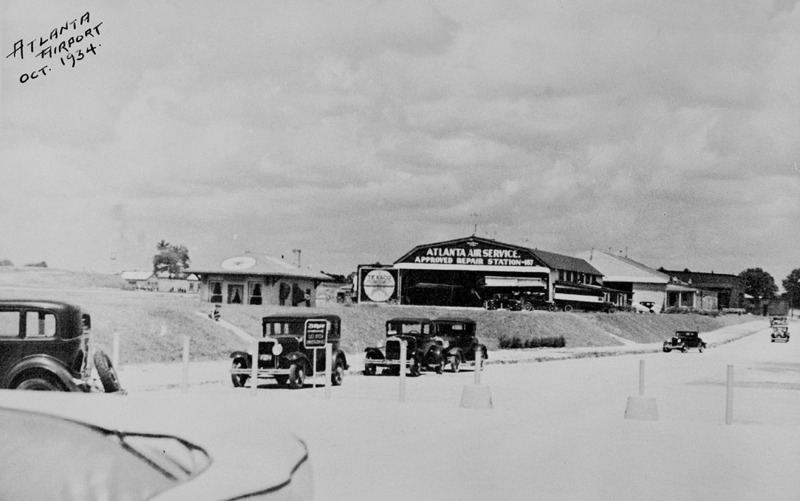 The view facing north from the passenger terminal in October 1934. The road seen here is now Delta Blvd. and these buildings stood on the site of what is now Delta's world headquarters. 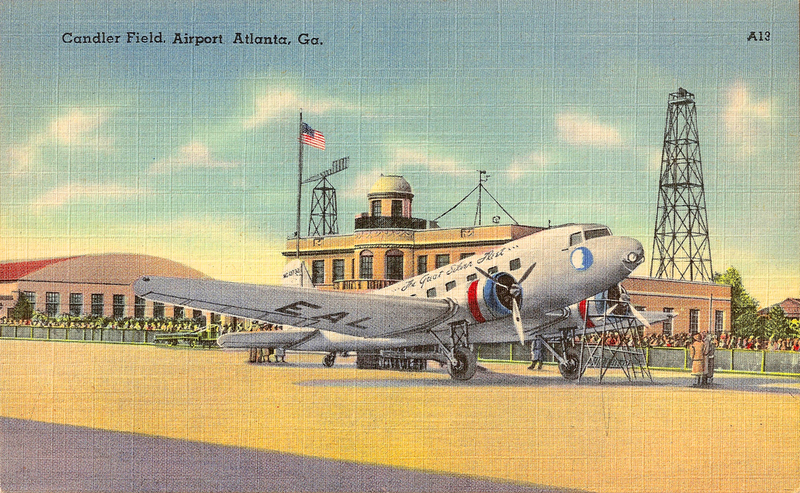 A beautiful mid-1930s postcard showing an Eastern Air Lines Douglas DC-2 at the passenger terminal. 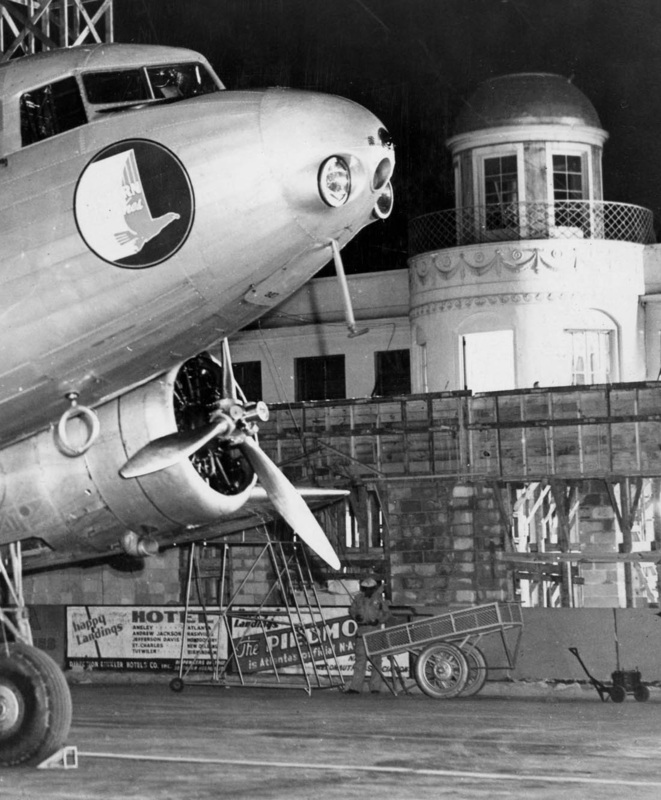 Eastern began flying DC-2s in late 1934. 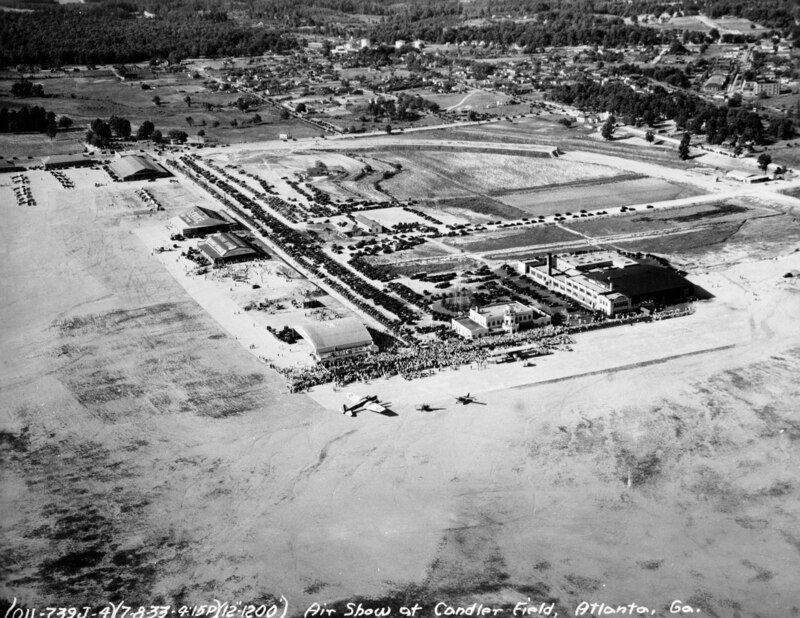 A fantastic aerial from early 1935 courtesy of Greg Germani at the Atlanta Time Machine. An Eastern Air Lines Douglas DC-2 can be seen on the ramp in front of the terminal. At far right there is a Stinson Model A and a Curtis Condor biplane, two airliner types made obsolete by the introduction of the DC-2. Click HERE for the large version. Here's an incredible piece of history: a color home movie from Summer 1938 showing the arrivals and departures of Eastern DC-2s and DC-3s. An Eastern Air Lines DC-2 at Atlanta in August 1938. In the background, construction had begun on the new control tower / administration building that would open the following year. A close up of the same photo. So many little details to look at! This aerial photo, facing north, shows the new control tower under construction. The Atlanta skyline can be seen through the haze at top right. Another view of the airport buildings, this time facing southeast. Look closely and you can see an airborne DC-2 just to the left of the center of the photo. 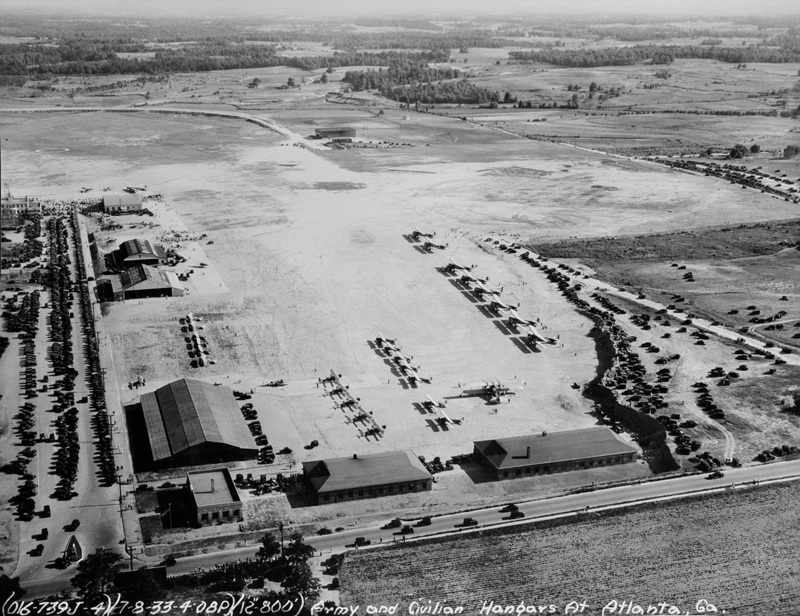 A circa 1938 aerial view of the Blevins and Atlanta Air Service hangars. Click HERE for hi-res version. Photo courtesy of the Georgia State University Library Digital Collections. A new six story control tower and administration building opened in 1939. Vivien Leigh, followed by Olivia De Havilland, arrived in Atlanta for the premiere of Gone With The Wind on December 13, 1939. 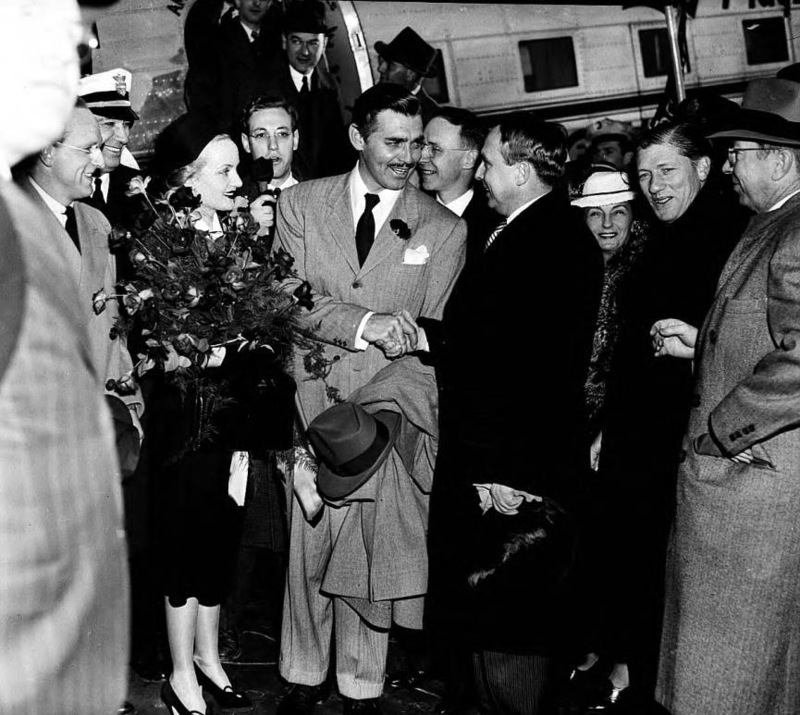 The following day, Clark Gable and wife Carole Lombard were greeted by Georgia Governor Rivers upon their arrival at Atlanta Municipal Airport. William Hartsfield is to the right of Gable, just behind his left shoulder. Photo courtesy of the Georgia State University Library Digital Collections.